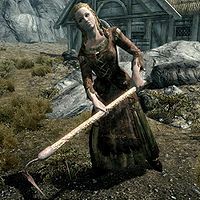 Gwendolyn is a Nord farmer living at Battle-Born Farm outside Whiterun. She lives a relaxed existence and oversees the daily maintenance of the many crops; she sleeps inside the farmhouse every night between midnight and 8am, then heads outside to do farming duties for twelve solid hours. At 8pm she returns to the house where she spends the rest of the evening. She wields an iron dagger and wears a simple set of farm clothes along with a pair of boots. She carries the farmhouse key and some common items, food, and gold. She can never sleep as intended due to her AI package having an improper start time and duration.